Hazem El-Mestikawy is an established international artist known for his minimalist sculpture pieces based on units inspired by Islamic architecture, Sufism, and ancient Egyptian art. El-Mestikawy uses recycled and seemingly fragile material, such as cardboard, paper and newspaper, to construct robust and puzzle-like sculptural installations that are displayed on walls. Juxtaposition will include two series by the artist, the first titled “18 Days”, which tackles the 2011 Egyptian revolution, while the second series draws from Islamic Calligraphy, while also exploring themes of identity and gender, past and present. El Mestikawy was previously shortlisted in 2011 for the prestigious Jameel Art Prize, launched by the Victoria and Albert Museum in London, 2011. 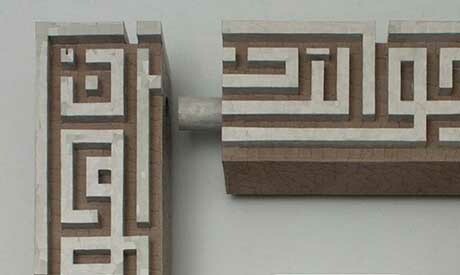 His work Patent Pattern earned him the grand prize at the thirteenth Asia Art Biennale in Bangladesh. The North Carolina Museum of Art and the Jameel Museum in Dubai have also both acquired artworks by El-Mestikawy.